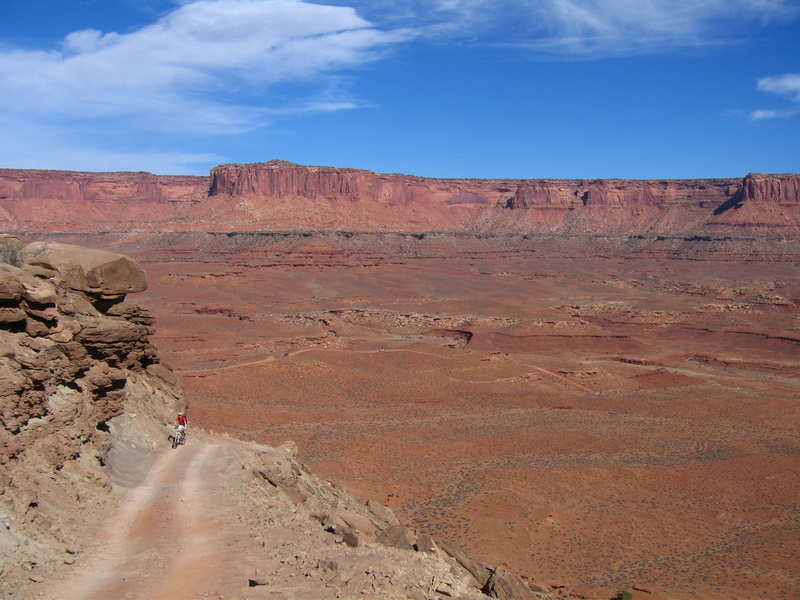 A break from school gave me the chance to go on a nice, relaxed mountain biking trip along the White Rim Trail in Canyonlands National Park. 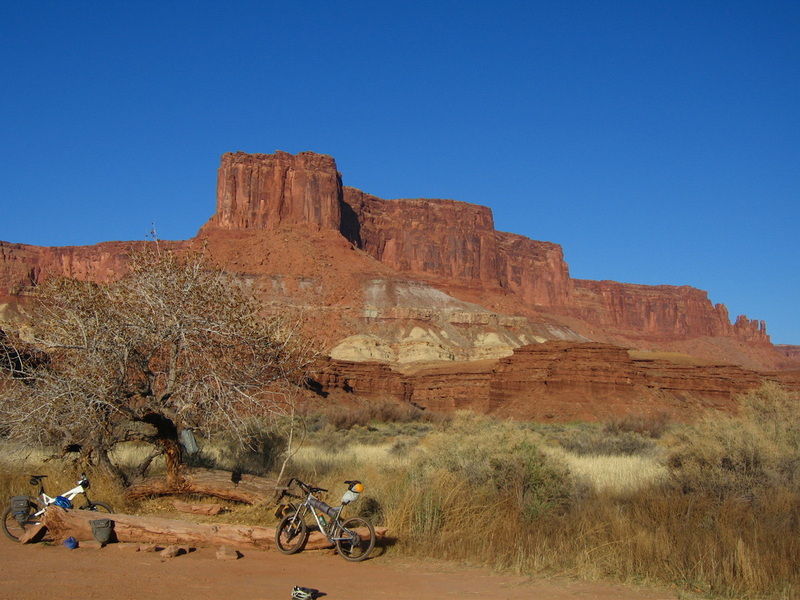 I have never owned a nice mountain bike so I borrowed one from my roommate and towards the end of the month we drove out to Moab in Scott's jeep. 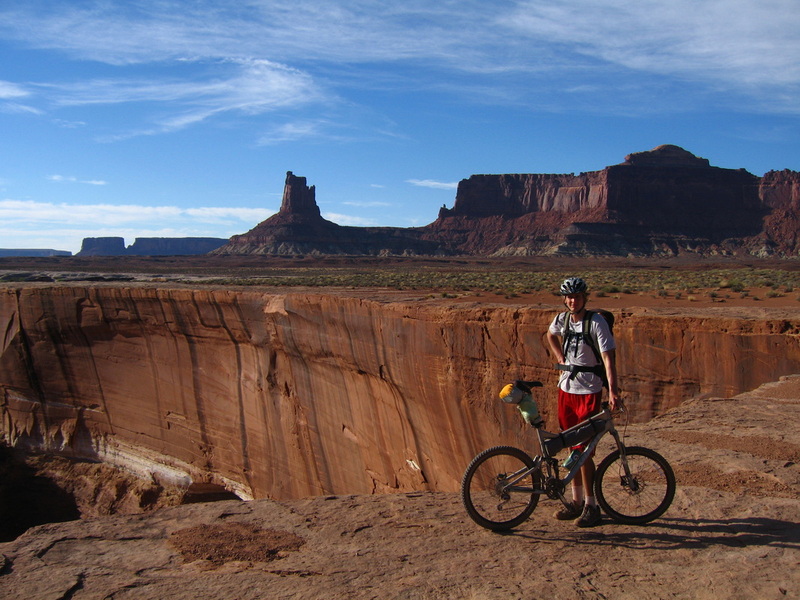 We met with a large group of his friends who were renting a house just outside town and made a short group ride near Poison Spider Mesa. I ended up having a lot of fun and was really enjoying the nice sunny weather. Unfortunately I don't remember the name of anyone else in the group but we had an awesome BBQ that night. The next morning, Scott and I headed for the Island in the Sky area and parked at the top of the Schaffer Trail. We met with one of Scott's friends who had the ambitious idea to try and bring his toddler son on the trip carrying him on the back of his bike. I didn't mind him tagging along but I was very skeptical it was going to work. So we started down the steep switch-backing trail using the brakes too much. 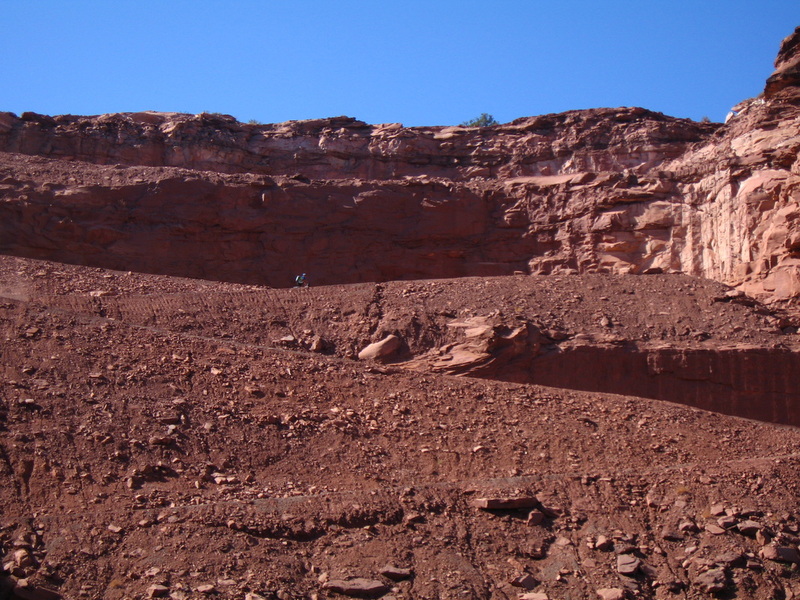 Once we got to the bottom we were on the huge bench halfway down to the Colorado River along the aptly named White Rim. 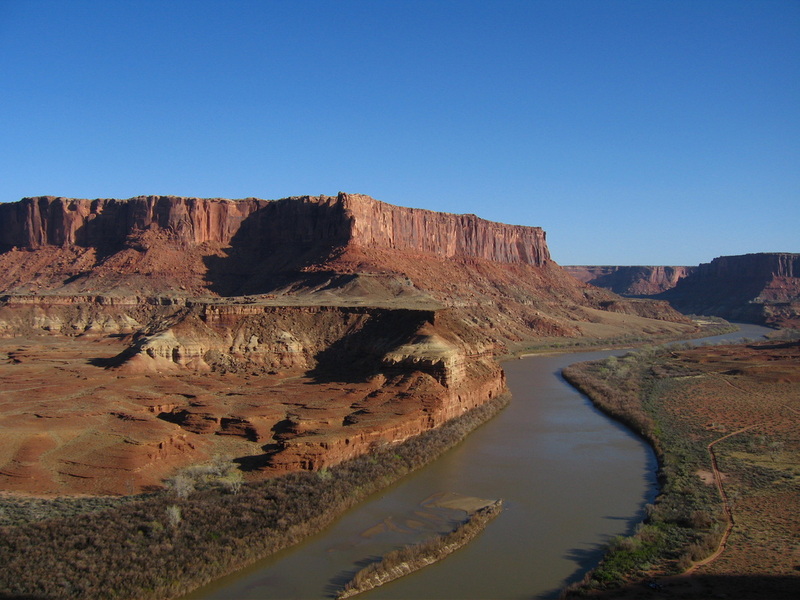 The White Rim is essentially a 5-10 foot thick sandstone formation that forms a very prominent ledge around the Colorado River gorge which is known as Cataract Canyon within Canyonlands. 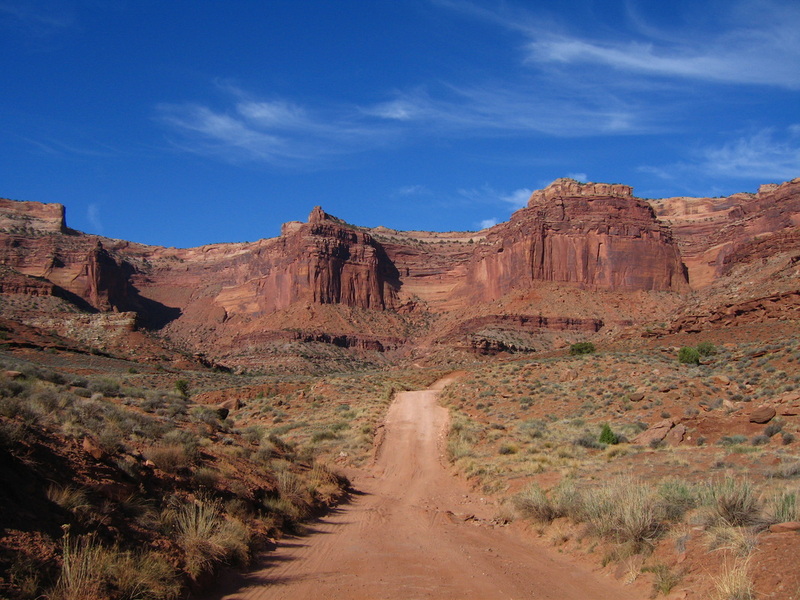 The White Rim trail follows this "rim" for over 70 miles in a large loop. As the day progressed, we biked around many topographical points and insets which made for a beautiful and secluded ride. 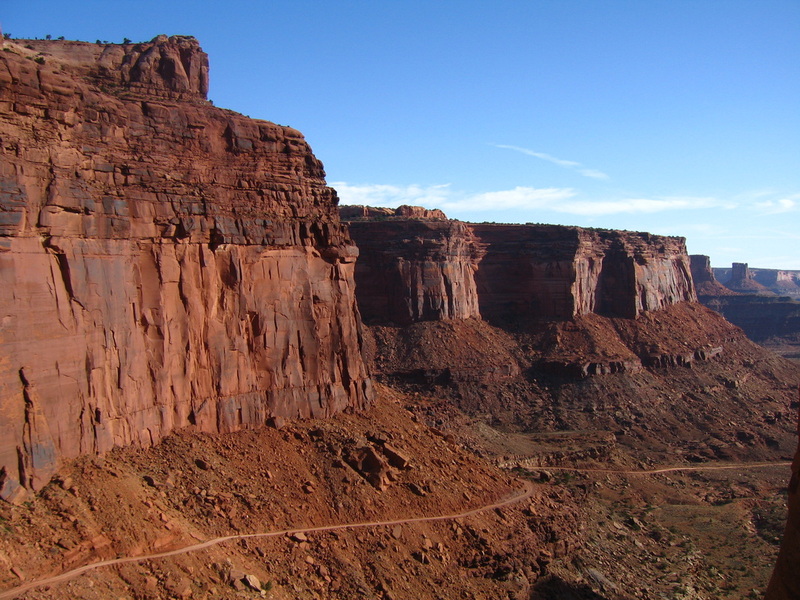 The cliffs above us were certainly awe inspiring and the weather was simply perfect. We passed a couple other bikers and caught up with a few families making the loop in their four wheel drive vehicles. 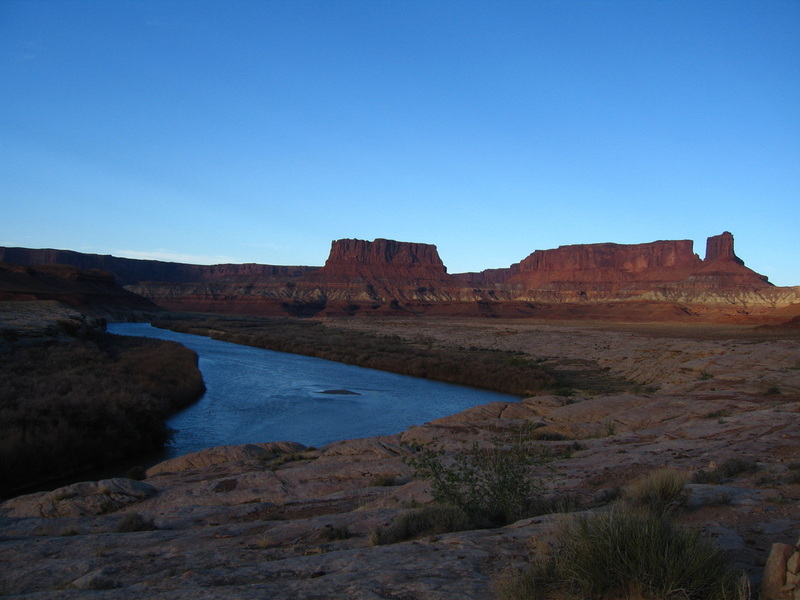 We planned to make the loop in two days spending one night along the Colorado River at the western side of the loop. I carried a light pack with just a sleeping bag and some food. Halfway through the day I went on ahead while Scott stayed back with his friend. They quickly realized he wasn't going to be able to carry his son the entire loop and luckily a nice family in a truck took his son in allowing them to ride at a quicker speed. I took a break by myself at a the top of a small ridge where I was able to talk with a nice group for awhile. Scott caught up with me fairly quickly and we continued on as the sun was getting lower. Scott's friend stayed back and let us push forward since we still had 20 miles to go to hit our assigned camp spot. I began to feel pretty good and we made excellent time as we continued downhill towards the river. Upon reaching the river, a large group camping were having a huge BBQ. Being low on food I didn't hesitate to accept their offer of fresh hot dogs, brats, and potato salad. They also had water saving us the extra effort of filtering water from the river. We filled up very nicely and enjoyed their company. I slept very well that night. The following morning we continued to follow the river down stream until we reached the climb back to the plateau at the top of the gorge. Luckily it was in the shade making the bike back up less miserable. I got about halfway up on the bike and walked the rest. Scott was waiting for me at the top and we ended up waiting awhile before finishing the last 10 miles on open terrain back to the highway. Once we got to the highway I waited while Scott road the paved road another 12 miles in a big headwind to go pick up the car. From that point it was a disappointing car ride back to GOlden to start school again.